On Wednesday June 12, Mercury will be at its maximum elongation from the Sun. A crescent Moon and brilliant Venus will frame it, making it particularly easy to see. Now is a great time to spot the planet Mercury, which is usually difficult to observe despite being one of the brightest objects in the sky. The problem with Mercury is that it never gets very far from the sun. It is the closest planet to the sun and rarely strays very far away, so most of the time its tiny speck of light is lost in our star's overwhelming glare. There is an added difficulty with the current apparition of Mercury for observers in the Northern Hemisphere. The current angle of the ecliptic — the path of the sun and planets in the sky — puts it very close to the horizon, so that planets like Mercury and Venus, which are both currently to the east of the sun, never get very high above the horizon. The good news is that Venus has recently emerged from behind the sun and now provides a brilliant beacon pointing the way to Mercury. At a location with a low western horizon, you should be able to spot Venus a few minutes after the sun sets, around 9 p.m. in most locations. Look for Venus slightly north of due west, low on the horizon. Mercury will be just above and to the left of Venus if you’re in the Northern Hemisphere. I find binoculars very helpful for spotting Mercury, the 7x50 and 10x50 size being especially useful. Focus the binoculars on Venus, then scan above and to its left for Mercury. Don't wait too long into the evening, for Mercury and Venus set quite quickly after the sun. On Monday (June 10), the thin crescent moon will join Mercury and Venus, and the three will form interesting patterns for the next few nights. 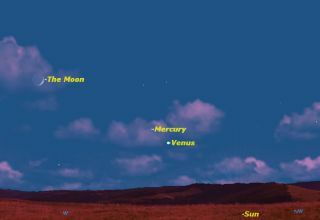 In the Southern Hemisphere, look for Mercury above and to the right of Venus. Because of the angle of the ecliptic, the planets will be much higher in the twilight sky than in the North. Some of you may be wondering why, if Mercury is the closest planet to the sun, it currently appears farther from the sun in the sky than Venus does. That’s because of the positions of Mercury and Venus in their respective orbits. On June 12, Mercury is at its maximum elongation from the sun, 24 degrees, while Venus is still far away on the far side of the sun. It won’t reach its maximum elongation from the sun, 47 degrees, until Nov. 1, by which time Mercury will be on the other side of the sun, in the morning sky. This article was provided to SPACE.com by Starry Night Education, the leader in space science curriculum solutions. Follow Starry Night on Twitter @StarryNightEdu. Follow us on Twitter, Facebook and Google+. Original article on SPACE.com.